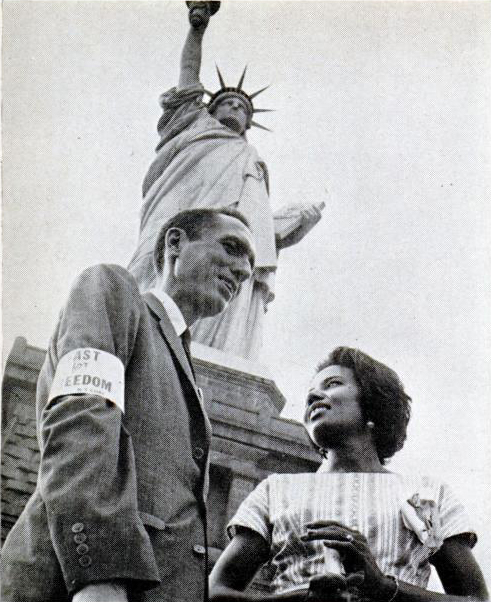 This is a photo of Gladys Harrington and James Peck under the Statue of Liberty, taken during New York CORE's 'Fast For Freedom' protests in support of the southern Woolworth's boycotts. Gladys Harrington at the time was chairman of New York CORE. Peck had been an active member of New York CORE since the early 1940's and remained one after the chapter moved uptown to Harlem. He was the founding editor of the CORE-lator and an original Freedom Rider with the earlier Journey of Reconciliation. 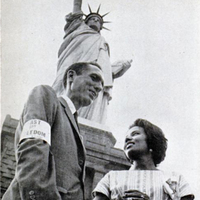 “photo of Gladys Harrington and James Peck, New York CORE ,” corenyc.org, accessed April 21, 2019, http://www.corenyc.org/omeka/items/show/135.